StreetSaw is one of the leading manufacturers of Hoverboards in the world – and with good reason. Their products are high quality, durable, and safe. It also doesn’t help that they dominate a large amount of the Hoverboard market with such a wide array of Hoverboards. Let’s look at the “RockSaw”, their off-road Hoverboard. Also worth noting about RockSaw’s tires (which goes for all off-road Hoverboards) is their mass: these tires are (by necessity) huge. They’d have to be: otherwise, climbing over rocks an grassy fields, mud and snow-piles, hiking paths and sand… would be a challenge. The RockSaw is all about conquering challenges. The reason RockSaw is the “younger” sibling is due to it being StreetSaw’s most recent introduction in its’ Hoverboard line-up. It came out with a bang, however: powered by two 400W motors (800W), the RockSaw is a tremendous beast. However, these watt numbers are the industry standard for off-road Hoverboards, as the added power is necessary for conquering rough terrain. That, however, doesn’t mean the RockSaw is average. No, the Rocksaw can in fact support a person up to 300 lbs. This is a HUGE deal, because almost all other Hoverboards can only carry 260+lbs. For a Hoverboard to carry up to 300 lbs. is nearly a world-wide record (if there were a weight-capacity competition for Hoverboards). But… let’s take a step backwards and look at some of the cons of the RockSaw. As awesome as this thing is, it’s a heavy piece of machinery. If you don’t mind carrying a staggering 32 lbs. (say, up a hill or through the woods), then by all means do your thing. I personally enjoy lifting the heavier self-balancing scooters and using them for dumbbells. But, sometimes you just don’t want to lift anything at all. So it’s worth keeping this weight in mind if you buy it. Also worth keeping in mind is its speed: 9-10.5 mph. While this isn’t anything to sigh or frown at, it’s just not the fastest Hoverboard out there – even among its off-road brethren. (Which is understandable, right?) In order to go off-road, corners had to be cut. To have a fast AND light board that handles all terrain? I don’t think we can engineer that type of machinery just yet. So what if the RockSaw is heavy and “slow”? I personally love the fact it can go off-road, through hiking trails and backwood, rocky paths and take you almost anywhere you want. While we’re on the subject of traveling, let’s talk about distance. The RockSaw can take you up to 12.5 miles on a single battery charge. 12.5 miles is nothing to sneeze at, or laugh about. (Which equates to roughly 5 hours of single, continuous riding.) Plus, when the battery dies and it’s time for a re-charge… Expect to wait anywhere between an hour to an hour and a half. This charging time is among the shortest charging times out there – as the “average” charging time of most commercial Hoverboards is between 2-3 hours. So for a massive board this size to charge in half the time of smaller boards, is a tremendous feat that StreetSaw should wear with pride. 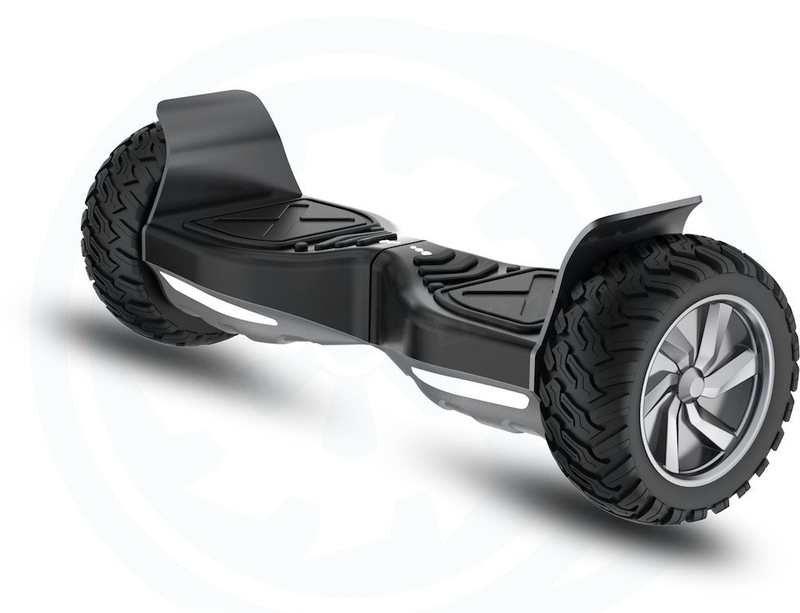 Overall, for a [$] price tag, I’d say StreetSaw’s RockSaw off-road Hoverboard is a terrific investment. Nothing beats the amount of raw, pure fun you’re going to have when you buy this board.